Okay, so I know I’m incredibly late. But the holidays were insane around here for us and then we took off to Florida for our babymoon. 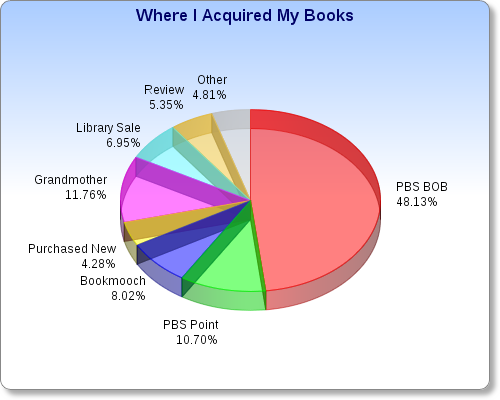 Now that I’m home and have had a little time to rest up I’m ready to sit down and share with everyone what my reading looked like in 2011. In the years past I have just given you a bunch of different numbers. This year I’m going for a more pretty look, complete with graphs and charts! If it overwhelms you, I apologize now. I’m just trying something new out. So without further ado, drumroll please….. 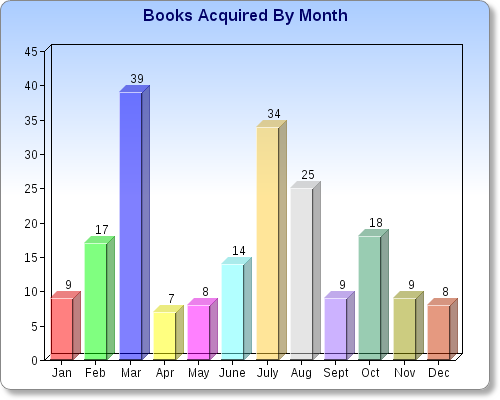 I made a chart showing how my reading broke down month by month. 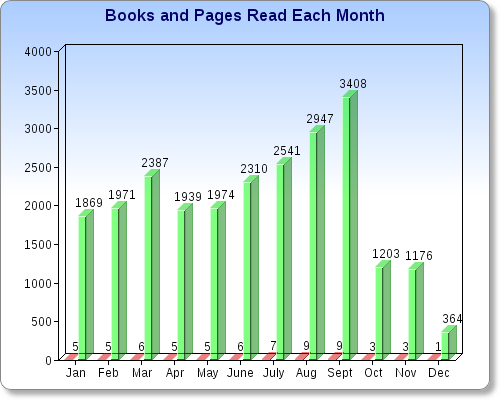 As I stated above, I was doing really well until October 🙂 The green lines indicate the number of pages read, and if you look way at the bottom, just above the months, you can see the number of books read. Of the 64 books I read, 61 were fiction and 3 were non-fiction. 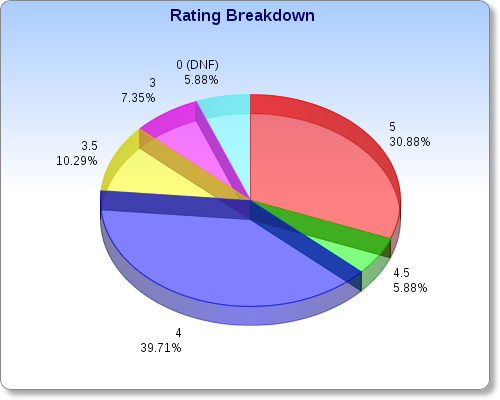 Not really all that pleased with that breakdown. I need to read more non-fiction. I enjoy non-fiction, I love true crime and good history books. I just don’t read a lot of them any more because I’m usually looking for an escape. Maybe I can read a little more non-fiction in 2012. A girl can hope, right? When I sat down and tried to look back over my reading list as a whole, I realized that I didn’t really read a lot of books that would make my top 10 list. I was a little disappointed by that. So this year, I only have a Top 7 Favorite Reads list. Obviously, I went a little nuts in March and July. In March I posted a ton of books onto Paperbackswap and got a lot of Box-of-Books swap requests as a result. And I obviously have a control issue when it comes to pushing that “decline” button. In July I went to the library book sale and I had a big box swap come in from a friend on one of my Yahoo groups. Obviously most of my books came from Paperbackswap’s Box-of-Books feature. This really doesn’t surprise me at all. I know I’m addicted to that, but for $8 a year and postage I can swap unlimited without points. Can’t hardly beat that in my opinion. Plus the more you swap at a time the more you save on postage. It’s kind of a win-win situation for me! I honestly didn’t spend a whole lot on buying new books, I try to avoid bookstores as much as possible simply because I have no self-control. 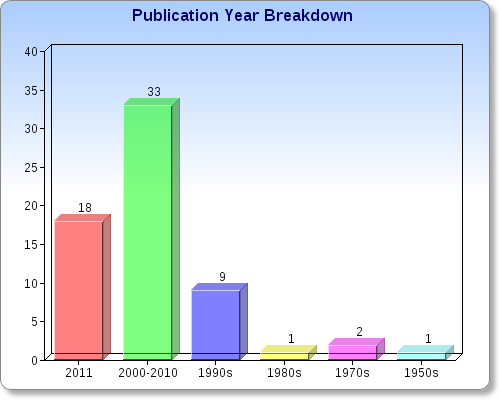 The amount of review books that I accepted in 2011 was way down. I became extremely selective. And I will be even more so in 2012 considering I’m probably not going to accept any review books – unless they are authors I have previously read and enjoyed. 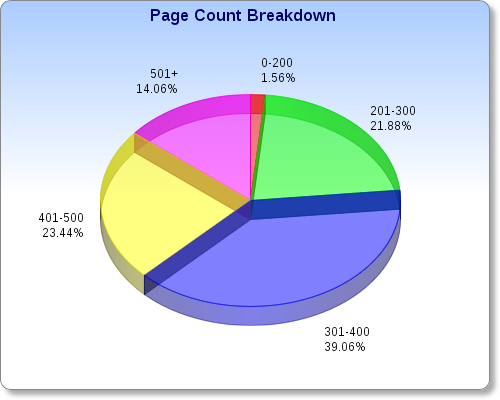 Finally I’m going to finish with a quick by the numbers breakdown of how I rated my books, the page count breakdown and the publication year breakdown. So there it is. That’s about all I have to share with everyone. I could have made a few more entries, but I think this adequately sums up my 2011 reading. Now I’m off to read …. I only have about 150 more pages before I finish my first book of 2012!! Happy reading everyone! Previous postI’m off on vacation…. It sounds like you had a great year of reading in 2011. I have Envy checked out from the library …I have to read it if you enjoyed it that much. Samantha – I would definitely recommend Envy … But I’m a huge Gregg Olsen fan.